Whoa!!! Now that’s a pretty big claim, pardner. I aim to mosey on over to United Church on Thursday at 5:30 p.m. to find out for myself just how “close to Mom’s” this hot dish actually is. Regardless, I know it is going to be good, as in Good. Of course, this means that we are starting our weekly “Simple Suppers.” We offer these low cost meals every Thursday evening before the Two Harbors City Band concert in Thomas Owens Park, right across the street. Dinner starts at 5:30, and the concert starts at 7:30. Less can be more. This was certainly the case with my mother’s hot dish. There were probably just 4 ingredients in the dish that I consider my favorite comfort food of all time–noodles, Campbell’s tomato soup, ground beef, and celery. When I’m making it, I can’t help but add a bit of this, and a pinch of that, and before you know it, it is nothing like the original, and not nearly as good. If it ain’t broke………. Economy is a basic ingredient in comfort food. (That makes five ingredients.) It’s not comfort food if you feel any distress due to the cost of the ingredients. Hmmmm, I wonder if I could apply this elsewhere in my day-to-day life? Celery is not useless, after all. Is there anything better than attending a Two Harbors City Band concert on a warm summer evening? Officially, no. But you can make the evening even sweeter, by having your evening meal right across the street from the band shell in Thomas Owens Park, at United Church of Two Harbors. For years we have been hosting “Simple Suppers,” delicious lost-cost meals for the public. These meals have turned into a popular community event, and have become a part of the longstanding concert-in-the-park tradition. Our first Simple Supper is on Thursday, June 21, before the Two Harbors City Band’s first concert of the year. Get to the church around 5:30 p.m. and start your evening off right! How’s This For a Resume’? One of the hymns we will be singing this coming Sunday is “Lift Every Voice and Sing”. 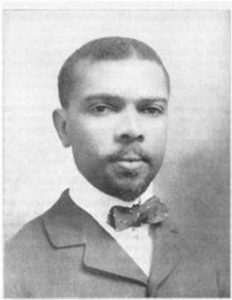 Coincidentally, June 17 is also the birthday of the hymn’s lyricist, James Weldon Johnson. I have been seeing this name for years, but I didn’t know anything about the man until today. Here is a very abbreviated list of his accomplishments: Songwriting collaboration with his brother J. Rosamund Johnson (including success on Broadway), author and poet, United States Consul to Venezuela and Nicaragua, executive secretary of the NAACP, professor, lawyer, supporter of the arts. He even had a U.S. Postage stamp issued in his honor.